So first writing, now reading. It’s really amazing how differently mom is doing after one month of having a momsitter three times per week. The typical menu of activities includes walking, reading, and puzzles. They also do whatever activity may be happening in the activity room: exercise, crafts, BINGO. It’s no surprise to anyone who reads this blog that anything involving music and especially singing is a hit. And one of the best parts of what’s happening with the momsitter is what’s happening when the momsitter is not around. Mom is sitting independently and reading. When I went on Sunday morning she was sitting and reading a Maya Angelou book we’d given her a decade ago for Mother’s Day and she’d always kept in her bedroom on her nightstand. The nurse told me she’d been sitting and reading it for almost two hours that day, every word and every page. By the time I get there she is on the last few pages. Who knows what of it she comprehends or what of it seems familiar having read it several times. I’m so happy she remembers how to read and has the patience and attention to sit and read for now. She will sit and read the captions in a photography book from start to finish. She’s even been reading the recipes from cookbooks; reading the very detailed description of ingredients and the descriptions of techniques. My mom always did love to read and try cooking new things. I think we will add a second momsitter for two additional days per week, so someone will be there five days per week for three hours each day. Three hours of time where someone is singularly focused on spending time with mom and doing things she loves and will stimulate her. I have to laugh at the ongoing discussions we have about the myriad of meds she’s on. We are preoccupied with the how to tweak the meds to get her to behave differently. It’s an impossible riddle…raise this med but lower this med. Observe any behavioral results? None? Then change the med, or the dosage, or both. In the end what’s caused her to behave differently in the shortest amount of time has been having another person to spend time with her, learn her, love her, and help her as needed. There is a lesson in there about all the best efforts to control behavior by meds… it isn’t fully successful without care, respect, generosity, acceptance, patience, and love. I’d say this momsitter experiment is a success. I don’t like to let people help me with the hard stuff. I get that from my mom and from my dad. We ask for help with the small tasks. For the hard stuff, we ask for help only after we’ve struggled silently with it, and it has consumed our minds or upset our bodies. I share my mom’s “nervous stomach.” We both would worry silently until it manifested into sharp, doubling over stomachaches. I share my dad’s chronic 4am wake up calls, where our brains turn on and won’t shut off. Usually it’s an endless doomsday loop of things we can’t possibly do anything about while laying on our backs in bed in the middle of the night, yet we are unable to stop the mental movie from playing. I’m trying to get better. There is a woman named Barb who works at the home where my mom lives. Her job is to take the residents to their medical and dental appointments. She drives a big, white, oversized, wheelchair-accessible van with the name of the home proudly displayed across the side. Barb is an explosion of energy. She moves patients in the deep heat of mid-summer, and she transports patients in the slushy, snowy days of mid-winter. 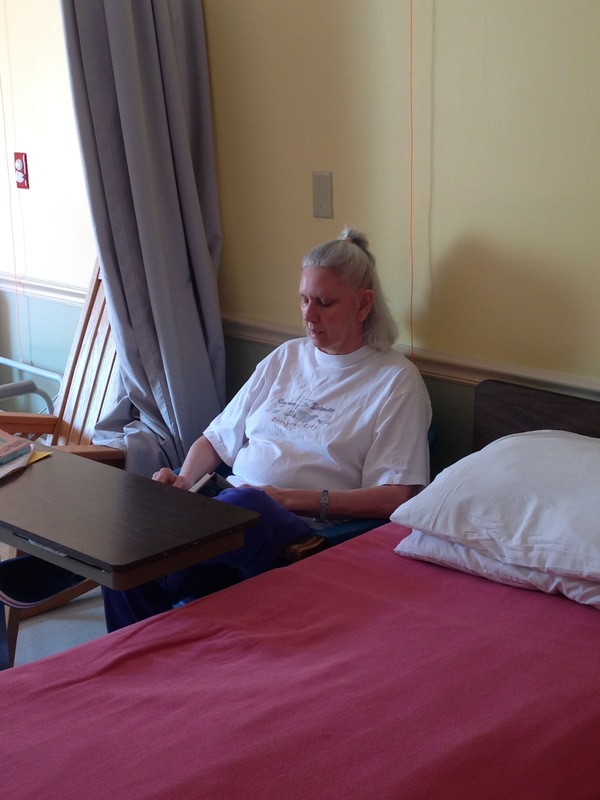 All of those residents with their different ailments, different needs, different abilities, Barb knows them all and she accommodates them. It’s her job and she is very good at it. I have it in my head that I need to take my mom to all her appointments. It’s only been in the last year I have been better about working with my brother and sister-in-law to have a plan for the three of us to take mom to all her appointments. Still I’ll agonize over an upcoming doctor’s appointment, trying to rework and rework my schedule to be able to take her. When I can’t, I call my brother and, less and less reluctantly these days, ask him for help. When neither of us can, I call Barb, and apologetically ask for her help. From the other end of the phone, Barb’s cheerfulness is disarming. Of course she will! And she usually has a little story to tell me about my mom before she hangs up. I couldn’t make a doctor’s appointment this week and Barb took mom. 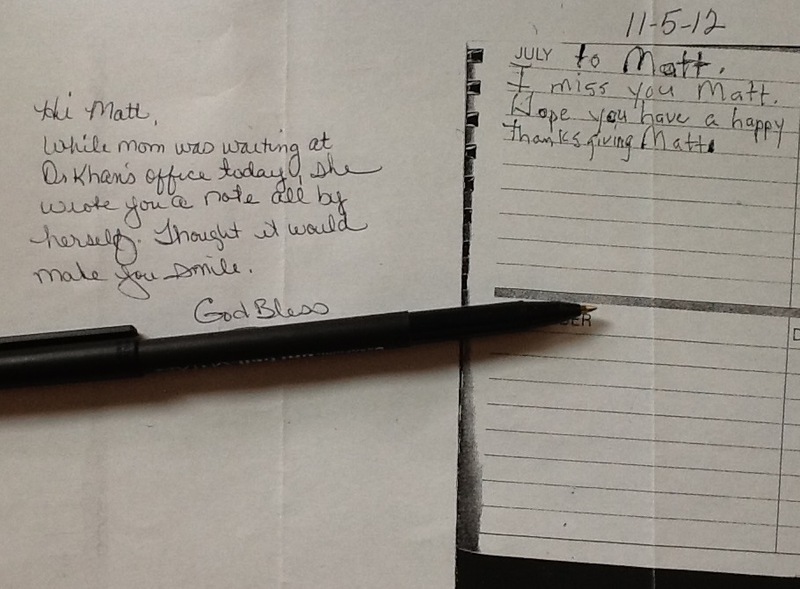 Today in the mail, was the following note from one of the people who works in the front office of the home. I assume Barb showed her this when she returned from mom’s appointment. And I was reminded that sometimes when you ask for help, something happens that is bigger than you could have accomplished on your own. I need to ask for help with the big, important stuff. I’m working on it. When I got the notification to renew my blog for another year, I couldn’t believe a year had gone by so quickly. I started this blog as a concrete space to remember things that were slipping away…my memories of my mom as she was, and the honest ups and downs of what is happening week to week. It began more than anything as a therapy for me. A place to organize my ideas and feelings and make that into something. And it’s grown in bits to be much more. It’s a window into our lives for friends and family to be a part. It’s connected me to kindred spirits I’ve never met, but have known a similar struggle. I’ve heard from so many people who never knew my mom, but through the blog she has become someone real to them; someone that reminds them of a person they loved and cared about. So I’ve signed on for another year. And though this started as the story of our journey, one of the most amazing things for me is that it’s become bigger than the story of us…it’s connected me to the story of all of us. The story of how we all love, and how we struggle to hold on to the wonderful for as long as we can.